My master bathroom has never been that special and my goal with the bathroom was to have it look elegant and have it look put together. I wanted a spa feel with touches of gold. I am in love with the new bath line at Pier 1. 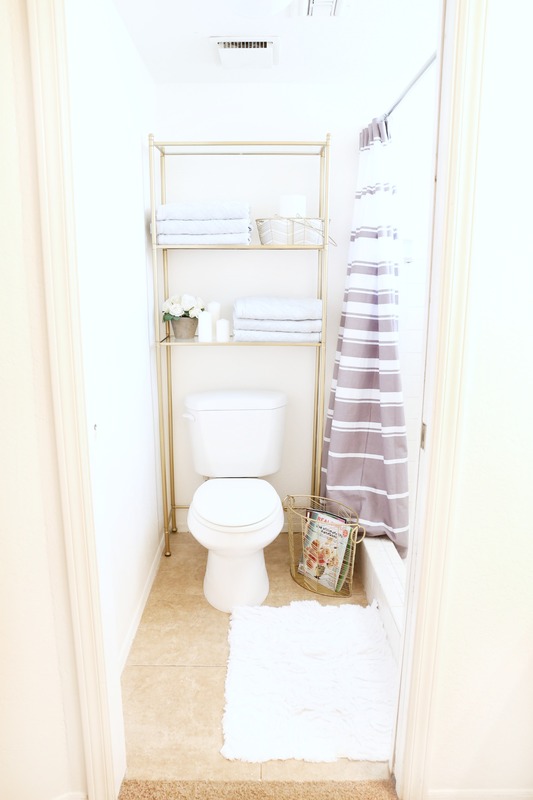 I was completely able to redo my little bathroom with everything from Pier 1. 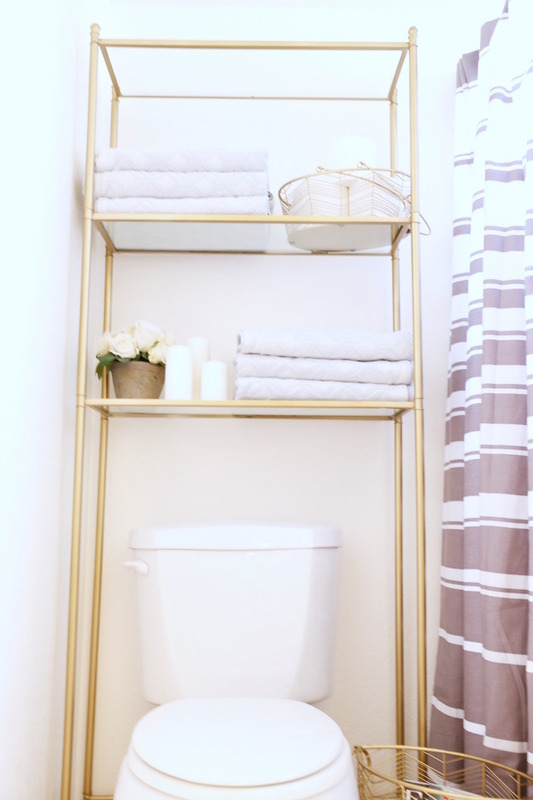 I started with this Luxe Bath Space Saver unit that goes around the toilet. Since this bathroom area is small I need some storage. This Space Saver unit was the perfect solution. First, it still goes with my elegant feel but it is very practical and offers the storage I need. Next thing I picked out was my shower curtain. I fell in love with this Striped Shower Curtain. I loved that it had a little bit of pattern and more of a neutral color. 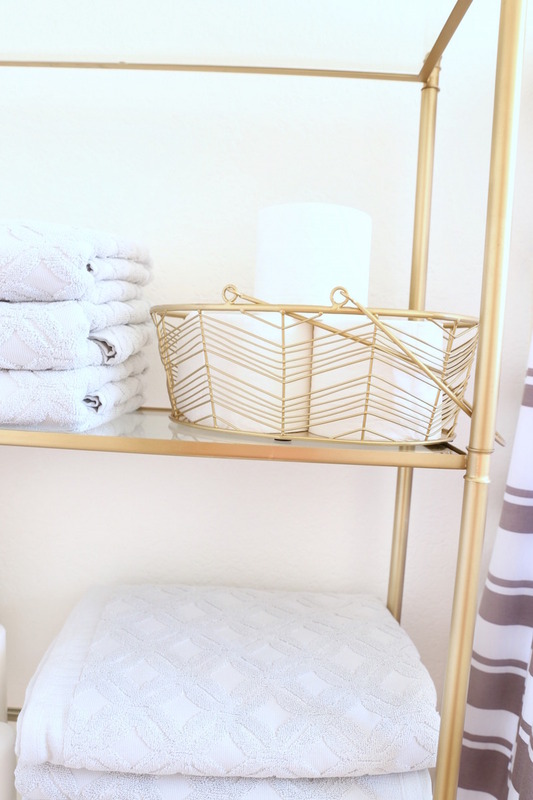 These towels from Pier 1 Links Collection are just so dreamy. They are super soft and I love the size of them. They are plenty big and I love the simple pattern and the color of them. I also needed a place to store extra toilet paper and so I got this Celeste Basket to store it and it also is very pretty. This Celeste Magazine Basket was just too cute to not get it and it matched my other baskets. I also got this super cute bath mat. I love the texture of the flowers. I love how my bathroom turned out. I love the soft colors and also love the pop of pattern. 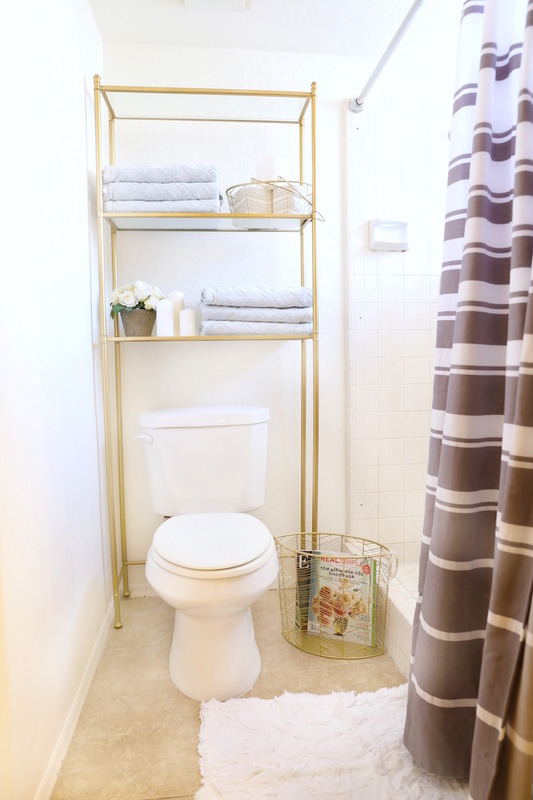 I love that this simple and smaller bathroom can be very elegant and have a very pretty look to it. Head over to Pier 1’s website and choose your favorite items from the new Bath collection then come back and leave a comment and let us know which product you like best! Extra Entries: Follow @classyclutter and @Pier 1 on Instagram – Leave a comment letting us know you are following both! I love, love, love the bird applique shower curtain. I really love the Holton hamper in Chestnut. It’s just so darling! I LOVE Pier One, and I’m a sucker for the clean, white look. When I saw this diamond-embossed rug, I died. 😉 Must have. I love the luxe 5 tier shelf in gold. Cute! I love the luxe five tier shelf in polished nickel. I’m in the middle of redoing my bathroom, and it would go perfectly in the space where I’ve had to tear down the old cabinets. 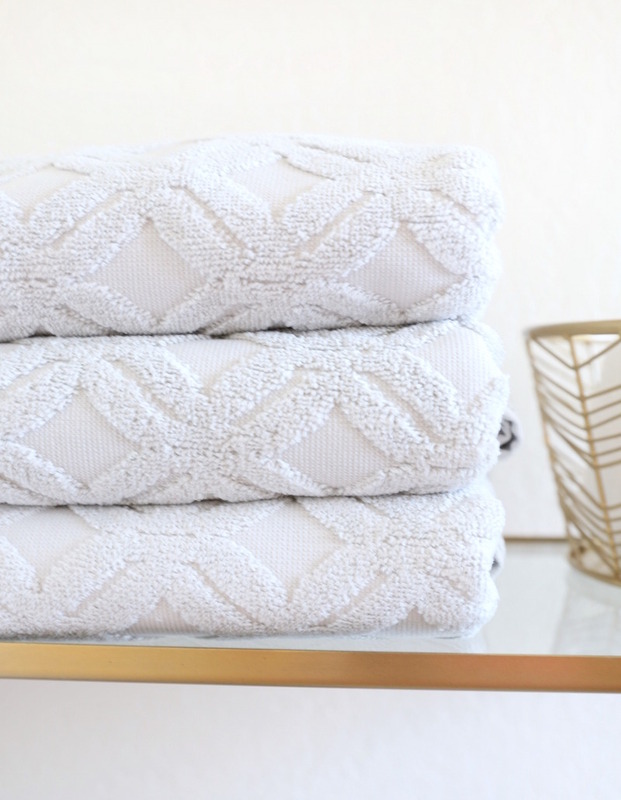 Love the Links bath towels and the luxe diamond bath rug! I like the Holtom Tall Cabinet in antique white. I’m also following you on Instagram. Thanks for the chance to win! OMG, did you see the silver elegan e bath collection?! That Luxe Bath Rug looked like it would feel like stepping on a cloud. Also loved, LOVED the Juliette Teardrop Mirror, which was MEANT for me since my name is Julie, right?! The Victory Rectangle Mirror was fabulous too! loved the Jacquard Chevron bath mat too! So pretty and soft looking. And last, I really loved all the gorgeous color and pattern in the Medallion Shower Curtain! Wait, how much is this gift card? LOl! Peir One really has the best looking stuff, and now for bathrooms too! I LOVE/want/need the ruffle shower curtains. Following classyclutter on instagram! Was already following under a different tag, thats how i saw this post….? you guys have 2, right? Oh well, whichever, i am following the one in the link now too!! LOL!! Thanks ladies! i also liked the luxe 5 tier shelf! 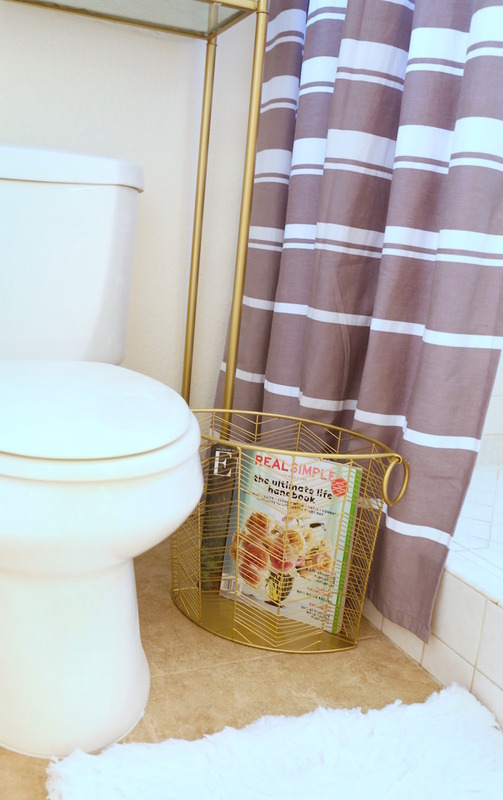 LOVE all the new bathroom accessories! I totally love the crackled glass accessories and they would look absolutely perfect with the Links towel collection! And of course I’m following both you and pier1! toscana-tall-cabinet—seafoam bathroom-storage. This has to be my fav peice for both the look and Organization . I love the crochet edge bath rug. I’m following both classy clutter and pier1 on instagram. 1- Love the moorish tile rugs and the Reflections mirror!!! Beautiful! Love the medallion shower curtain. On the lookout for a curtain for my small, awkward bath so perfect timing. I love the Charlotte bathroom collection. Just so elegant! I would love a new shower curtain like the green caspian tile one! Those can change the whole look of a bathroom! I follow both Classy Clutter and Pier 1 on Instagram as well! (@hootsofanightal) thanks for hosting such a great giveaway!! Following both on insta! I love the luxe diamond bath rugs! The white ruffle shower curtain is my favorite. Thanks for the chance! Love the Toscana Tall Cabinet as a medicine cabinet! 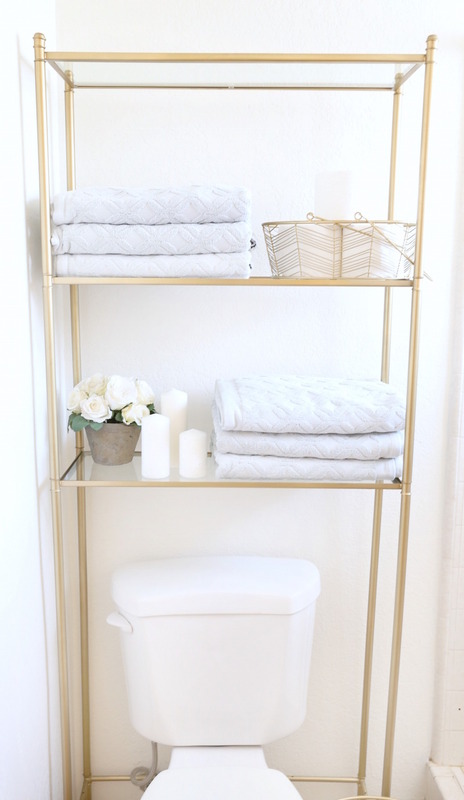 The Luxe 5 tier shelf in gold is so pretty! 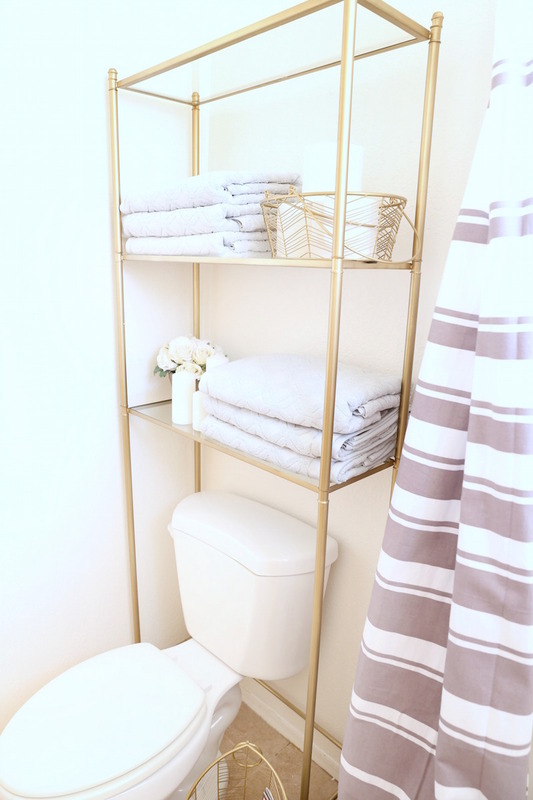 Love that gold three tier bath trolley! 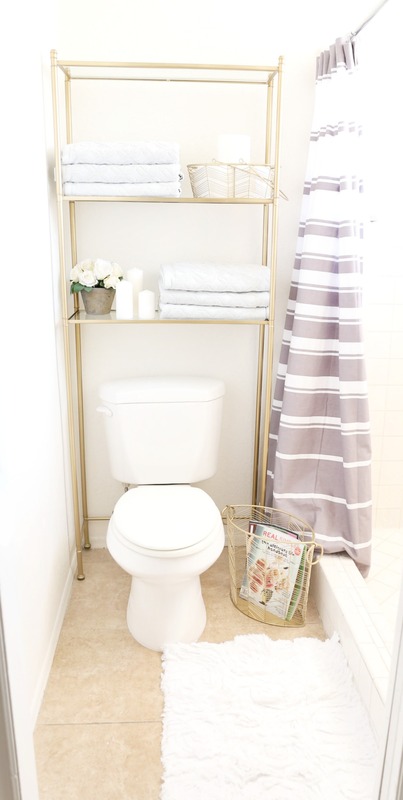 It would look so cute in a bathroom (obviously) but would also make a gorgeous bar cart! Following you both on Instagram! Obsessed with the trolley it could be super versatile is several rooms in the house! I like Cloud Step Memory Foam Bath Rug . I love the three tier shelves in silver!! So cute and a great way to store things! I also am following both on Instagram! I have such an unusual fetish for baskets. If I won, I would probably buy every single basket in the Celeste Basket collection… they are drool worthy!! I follow you both on Instagram under the name @ispywhimsy! Love the Toscana cabinets in Seafoam–fabulous color and fabulous storage! I like the Celeste Basket in the Medium Size! I follow you and Pier 1 on Instagram. I have just ordered new floors for two bathrooms that I am updating. I would like the Millie Hamper, with Cloud Step Memory Foam Bath Rugs as a close second. Thanks. I’m in the process of redoing my boys/main bathroom. The Striped Shower Curtain – Charcoal is just what I’m looking for. Loving the luxe bath cart in polished nickel!! –Following both of the instagram accounts listed! It would look amazing in my bathroom. The Toscana Tall cabinet in sky blue would be a fun diction of color in my master bath. Also the stacking glass canisters would be great for organizing everyday items. I love the three tier bath trolley. I like the fleur collection and all the pretty storage! I follow both pier 1 and classy clutter on instagram! Thanks! Oh my goodness- what a beautiful bathroom! I love it! If I were to win I would purchase the Medallion Shower Curtain. I love all of the beautiful colors! Love love love the Juliette Teardrop Mirror! Thanks for the entry! We are a family of 6 moving into our first home. I have been scouring all over the net looking for great ideas, so glad to have stumbled onto this amazing page! As far as items from Pier 1 bath collection I LOVE: The Vintage Style soap pump, Zuri Bathroom Accessories (I love green) and the Whitewashed wall hooks for our girls bathroom (we have 4!). The molten hamper antique and the Julianna Basket. Amazing stuff! I like the Holton Hamper in Antique White. I love the three tier shelf in grey! Great storage and unique look! I like the lux towel collection! Oh my goodness! This looks fantastic! I can tell you put a lot of hard work into this, and it really has paid off! Congratulations on all of your progress! Love the “Misted Blooms” shower curtain!